Official CW description and preview images with spoilers for the Legacies episode "There's Always A Loophole"
“There’s Always A Loophole” is the title of the Thursday, March 28 season finale for Legacies’ first season. Here’s how The CW describes it, complete with a few little spoilers sprinkled within this write-up. And yes, the show has been renewed for Season 2, so this is definitely not the end, in case there’s a cliffhanger. IT’S HERO TIME — When a group of unwelcome visitors descends upon The Salvatore School, Hope (Danielle Rose Russell) leads the charge to keep her friends safe. Meanwhile, MG (Quincy Fouse) uncovers a secret about his mother and Josie (Kaylee Bryant) finds herself in a dire situation. Matthew Davis, Jenny Boyd and Peyton Alex Smith also star. Mary Lou Bellucci directed the episode written by Brett Matthews (#116). Original airdate 3/28/2019. UPDATE: We now have some photos… enjoy! 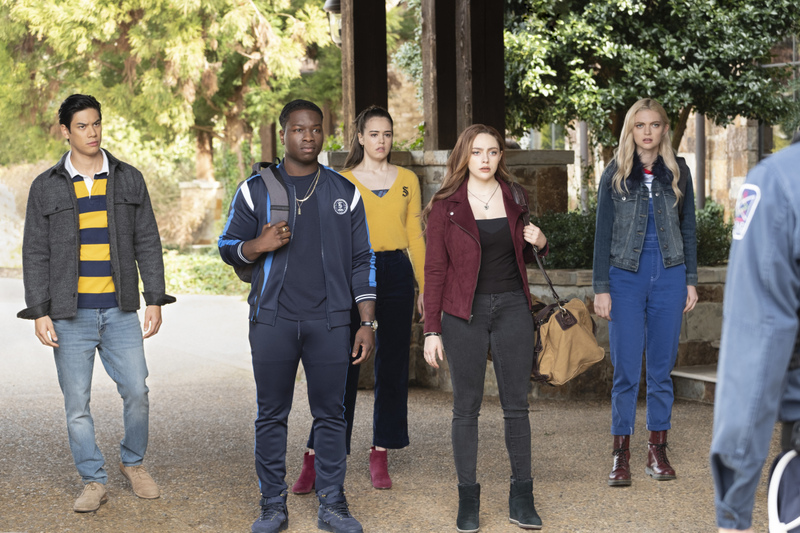 Legacies -- "There's Always a Loophole" -- Image Number: LGC116b_0004bc.jpg -- Pictured (L-R): Ben Levin as Jed, Christopher De'Sean Lee as Kaleb, Kaylee Bryant as Josie, Danielle Rose Russell as Hope, and Jenny Boyd as Lizzie -- Photo: Mark Hill/The CW -- ÃÂ© 2019 The CW Network, LLC. All rights reserved.